TurboSonic® consists of a sonic (sound) vibrating platform that the user stands or performs exercises on which stimulates bones, muscles, blood vessels and cells in a manner that promotes their rapid development and circulation. The sonic vertical movement of the plate stimulates the body's natural "stretch reflex" which causes a spontaneous muscle contraction to instinctively stretch and contract: both movements occur at varying rates between 3-50 times per second. (3Hz to 50Hz) This movement produces mechanical oscillations, which is the time required to induce a natural stretching reflex in the respective muscle via the muscle spindle during one up and down vertical movement. Exercise causes the body to tire; rest allows the body to recover. By repeating this process, the body adjusts to the level of effort, resulting in an increase in physical performance. This phenomenon, called super-compensation, similarly occurs when training on the TurboSonic® platform. However, compared with traditional training methods, greater results are achieved and hormonal production is increased in much less time when training on the TurboSonic®. The automatic modes are preset to 10 minute countdown sessions and depending on the mode selection, users can burn between 100 to 300 calories. You will also see increased flexibility each time you do a whole body vibration work-out. Touch your toes before your session, and again after the session. You'll be amazed. And, by the end of the session you won’t even be sweating or feel fatigued. What you will feel is less stress and more energy! What started out in the Russian space training programs to combat the effects of the gravity-free environment encountered by astronauts in outer space has evolved into a very effective human growth hormone (HGH) releasing machine. Sonic whole body vibration training encourage the release of key wellness, recovery and rehabilitation hormones such as serotonin, human growth hormone and testosterone. Vibration Therapy is used in the medical field for the treatment and prevention of a variety of illnesses, injuries, and adverse health conditions. Emphysema Ordinarily, patients with emphysema find it nearly impossible to undertake any kind of physical exercise. TurboSonic Vibration Therapy enables patients to achieve most of the benefits of a regular workout and helps them to do cardio-fitness training such as walking or even running. MS / ALS Patients with Multiple Sclerosis and Amyotrophic Lateral Sclerosis are unable to train because the nerves are no longer capable of controlling the muscles properly. TurboSonic Vibration activates the muscles directly without relying on the nervous system. Patients tend to feel better, have more energy to cope with everyday activities, experience less pain and are less dependent on others. Osteoporosis Millions of Americans, especially women, are at risk of developing this disease, which results from the decalcification of the bones due to hormonal imbalances. The bones become fragile with a tendency to break easily. 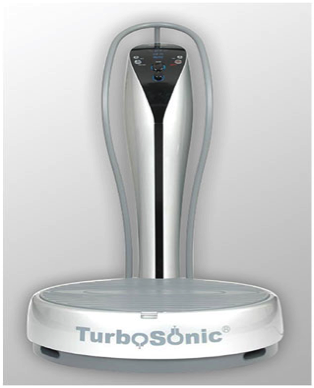 TurboSonic Vibration Therapy increases bone density, usually reversing the effects of osteoporosis. Arthritis and Rheumatism TurboSonic Vibration Therapy can reduce the pain and discomfort of these conditions. It has been proven to increase blood circulation in the joints and dramatically improve flexibility and range of motion. Lower Back Pain TurboSonic Vibration Therapy can strengthen the weakened lower back muscles that cause back pain. (Patients with an acute back hernia should not use Vibration Therapy). Pelvic Instability This condition usually results from softening of the connective tissue during pregnancy. TurboSonic Vibration Therapy quickly brings the hormonal system into balance, enabling connective tissue to recover its strength and firmness. Excess Body Fat TurboSonic Vibration Therapy works several ways to dissolve excess body fat; it increases metabolism which burns calories more rapidly; increases blood circulation and lymphatic drainage thereby removing toxins faster. Human Growth Hormone secretion increases dramatically (460%). Excess body fat melts away effortlessly. People who use the TurboSonic Vibration Trainer for 10 minutes, three times a week, lose significantly more fat than those who engage in aerobic activity for one hour three times a week! Cellulite Those lumpy fatty deposits that form an unattractive dimpling effect around the thighs and other parts simply melt away under TurboSonic Vibration Therapy. Stress Modern life is stressful, causing the release of toxic stress hormones such as cortisol and epinephrine, which throw the immune system out of balance and destroy brain cells by the millions. Sonic Vibration Therapy increases human growth hormone and serotonin (the "happiness, relaxation and well-being hormone") secretion, lowers cortisol and epinephrine secretion 31%, and enhances circulation, all of which counteract the effects of stress on the body and spirit. Disclaimer TurboSonic is not intended to diagnose, treat or cure any disease. The benefits listed herein this web site are based on independent studies, which reference years of research into (WBV) whole body vibration therapy and training and those studies are independent of the TurboSonic technology and have not been evaluated by the FDA.